The Ponte della Libertà (English: Bridge of Liberty) is the bridge that connects the city of Venice to the mainland, and is the only route into the city by road. Once you have reached Venice, you are obliged to park and to move around on foot or by steamboat. Parclick helps you find the best parking space close to Ponte della Libertà, giving you the possibility to book it in advance, so that you don’t find yourself empty handed once you get there! The closest car parks are in Venezia Mestre, where you can easily leave your vehicle and reach the lagoon via the numerous buses that cross the bridge or by train from Venezia Mestre station to Venezia Santa Lucia station in just a couple of minutes. 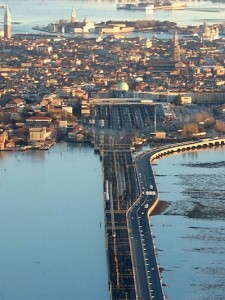 The Ponte della Libertà besides being for road traffic is also for rail. If you prefer crossing by car, Parclick recommends parking in Piazzale Roma, the city’s last area suitable for automobiles, from where you can move around on foot, or take a steamboat directly to any point of the lagoon. The Ponte della Libertà, also locally known as the Ponte Lungo (English: Long Bridge), is four kilometres long and has been a railway bridge to Venice since 1846, a time when it was the longest bridge in the world. More recently a road lane has been added for all private and public traffic. Its inauguration was made in 1933 and the bridge was then called Ponte Littorio. This name was changed after the Second World War in memory of Italy’s freeing from nazi-fascism, and so it became known by its modern day name. The Ponte della Libertà, along with Piazzale Roma and Tronchetto, is also one of the few zones where it is possible to move around by car, given that the rest of the city is crossed by canals instead of roads. This makes it a crucial gateway for anyone who wishes to reach Venice by car, so finding your parking space near Ponte della Libertà is fundamental to say the least. Book your spot now with Parclick and start your visit to Venice without any hassle!